The Text Editor Example presents a sample HTML file using the TextArea control, preserving the HTML formatting. The application comes with two user interfaces; one for traditional desktop platforms with a mouse pointer, and another simpler, touch-oriented version. The desktop version is a complete text editor with capabilities for formatting text, and opening and saving HTML and plain text files. 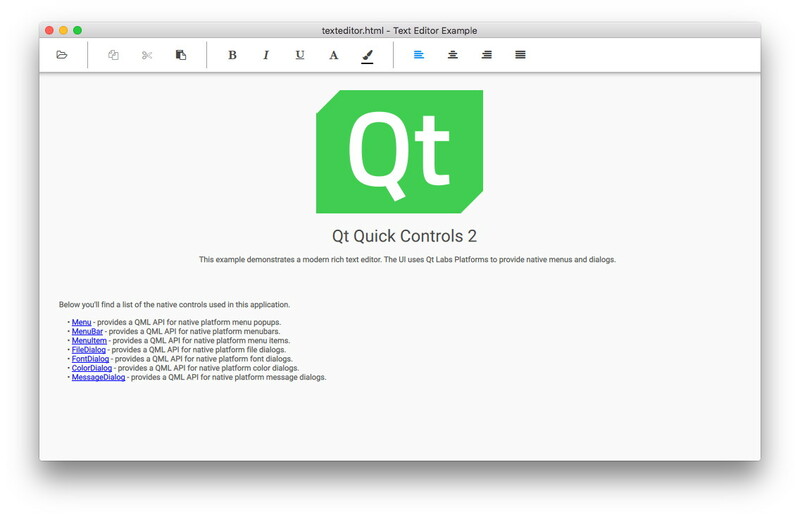 It demonstrates the native-looking dialogs and menus using the Qt Labs Platform module. These types are mostly suitable for desktop platforms with support for multiple top-level windows, a mouse pointer, and moderate screen size. Note: There is also a standard menubar with more options than the context menu. The touch user interface is a simplified version of the text editor. It is suitable for touch devices with limited screen size. The example uses file selectors to load the appropriate user interface automatically. 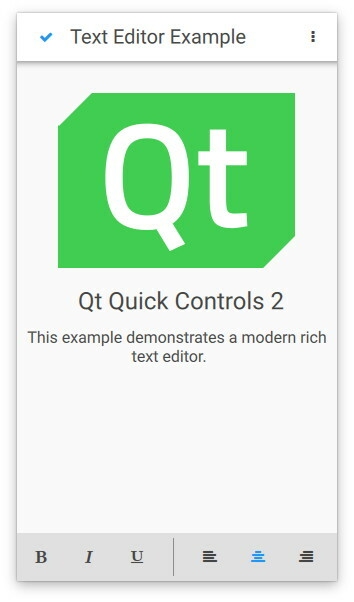 Unlike the desktop version, which uses top-level dialogs, the touch version uses the QML Dialog type, which is not a top-level window. This type of dialog is fully supported on mobile and embedded platforms that do not support multiple top-level windows. Both user interfaces use the same C++ backend, which supports opening, formatting, and editing a document. The C++ class, DocumentHandler, extends QObject and is registered as a QML type under the namespace io.qt.examples.texteditor 1.0. The following snippets show how the type is registered under a namespace and later imported and instantiated by main.qml. For more information about registering C++ classes as QML types, see Defining QML Types from C++.